Jutting out into the gulf between Athens and Thessaloniki, the Pelion peninsula is where the Greeks thought their gods came on holiday. This peninsula, which soars upwards 5,000 feet in a matter of miles, is very different from the rest of the Greek coast. Laced with streams and rivers it's very lush, something which apple, apricot and chestnut growers have taken advantage off. In the winter, Mount Pelion, gets enough snow to support a ski resort. The best places to stay in Pelion can be found both beachside and in the heart of the countryside. The beaches are a mix of long stretches of shingle and small coves. The landscape is dry. Some are backed by beach resorts and some by small fishing villages. All have crystal clear waters. By Mylopotamos the coves are particularly beautiful and the fact that the coastline itself is relatively undeveloped makes it peaceful. Damouchari, just south of Agios Ioannis, is the right place to go if you're looking for the prettiest village! There's a lovely little harbour, around which there are stone houses and narrow car-free streets. There's also a lovely, quiet beach. A great way to explore this region is along the donkey paths, which still provide the main link between some villages. These criss cross the whole area and make for easy exploration. Harvest time is one of the best seasons to explore the region on foot, it's very colourful. One of the best places to stay in Pelion for walkers is Tsangaragha. On a hillside amongst apple orchards this village boasts Greece's oldest plane tree, among other similarly charming features. If you're looking for somewhere right off the beaten track, visit Trikeri island just off the peninsula's foot. Car free and only 2.5kms across, you can only get to the island by water taxi. The island has plenty of walking paths mostly ending at deserted beaches, or the 18th Century monastery on the top of the hill. Pelion's mix of stunning mountain landscape and beautiful coastal strips is a winning combination and our selection of the best places to stay in Pelion all seek to harness the area's abundant natural beauty. Amanita Traditional Hotel is perfect for those looking for authentic Greek hospitality. Set in a beautiful stone house amidst stunning gardens, it's like stepping into a glorious Greek home. With lovely rooms and magnificent views, it's a real gem. 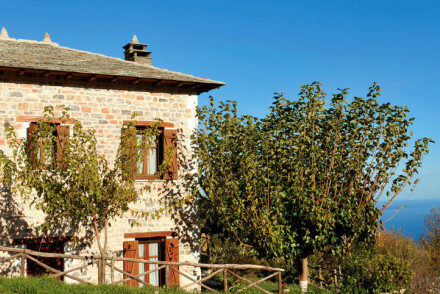 Set in a small hillside village, Santikos Mansion exudes local charm and character. With homely, traditional interiors. comfortable rooms and excellent views, it's perfect for a taste of trademark Greek hospitality. 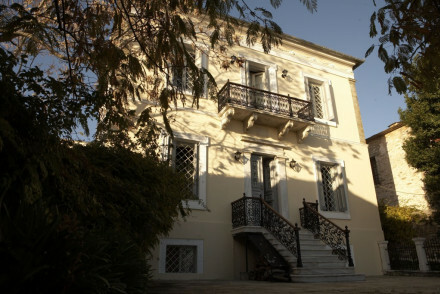 Set in a stunning Grecian villa, Arhontiko Ioannides is full of historical treasures. Boasting an elegant aesthetic and beautifully appointed rooms, this place has a touch of class. Offering access to both the beaches and the mountains, this is a great launchpad for exploring Pelion. Six Keys transformation from a boat yard into a boutique hotel is a thing of beauty. With superbly designed rooms and impressive views out over the sea, this hotel captures the romance of the area. Enjoy excellent seafood and delicious cocktails at the hotel's fun beach bar. Anovolios is perfect for adventurers. Located in the highest village on the peninsula the views are stunning. Plus they can arrange walking tours with a professional guide. Little Swallows is also situated in the mountains. Here you'll find elegant rooms with hand carved beds and a lovely terrace with pool - perfect for relaxing after a day exploring on foot! For those looking for their own space, we recommend visiting our online partner Booking.com. The nearest international airports to Pelion are Athens and Thessaloniki. Pelion is perfect for exploring by car, so visit our car hire partner Rentalcars. Pelion is the perfect destination for those in search of summer sun with temperatures sitting in the mid 20s from June to September. Browse our list of all the best places to stay in Pelion. Alternatively call or email one of our gurus for advice. 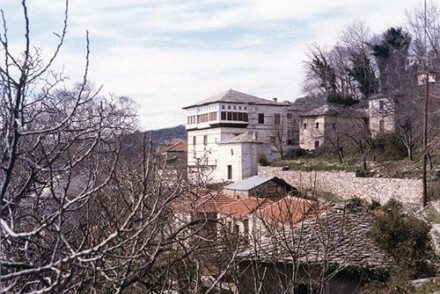 A fabulous traditional hotel in the highest mountain village of Pelion. Elegant rooms sleep up to four people and have stone walls, wooden floors, fireplaces, and attractive beds. A great choice for an active mountain holiday for couples, groups of friends and families. Great value too. A rural Grecian villa with elegant romance just below the Mountains of Pelion. Traditional chic interiors and rooms have fireplaces, private balconies, paintings, some with private hot tubs. Excellent breakfasts and a laid back atmosphere. Perfect for local exploring. Skiing - In the winter. Sights nearby - Tsagarada Plane Tree. A charming property set amidst picture perfect gardens. Traditional interiors include exposed stone walls, beamed ceilings and antique furniture. An indulgent Greek breakfast is served. Close to both mountain and ocean giving the best of both worlds. Perfect for an authentic Greek experience. Active Holiday - With close priximity to both sea and mountain there are numerous activities to keep outdoor adventurists entertained. Kayaking - Explore the coves and beaches on a sea kayak. Restrictions on children - Children over six are welcome. A large traditional house in a mountain village with beautiful valley views. Traditional elegant rooms have carved wooden beds, wooden beams and wooden floors. Lovely terrace and pool. A great choice for families, couples and groups of friends. Great value and lots to do in the surrounds. 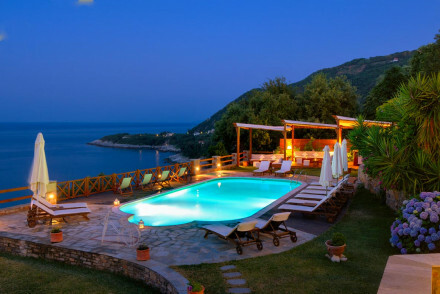 A stunning Grecian villa on Mount Pelion with fantastic sea views. Beautiful rooms, some triples, and a few romantic cottages in the garden. Traditional elegance and artisanal painting throughout the interiors. Delicious breakfasts, swimming pool, and plenty to do on the beach and the mountain. Romantic Break - Four traditional stone bungalows in the garden with panoramic view are very romantic. Views - Breathtaking views both to the village and to the sea of Pagasitikos gulf. Sights nearby - The old train station of the famous “Moutzouris” next to the waterfall. Great walks - Walking tours to the Pelion villages. 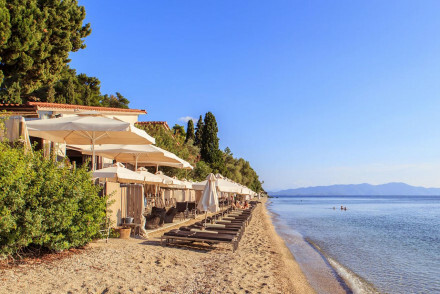 A stunning beachfront hotel on the doorstep of the Aegean. Classic interior design complements the country villa feel of the guesthouse; comfortable suites offer private living space and open out onto pretty terraces. Dine at the seafront restaurant or relax at the hotel bar. A cosy beach hotel. Stunning guest house in the heart of Pinakates. Seven en suite rooms, with classic stone walls, wooden ceilings, plush modern furnishings, and marble bathrooms. Guests sit by stone fireplaces, unwind in the spa, lie by the pool, and enjoy panoramic views from the terrace; the ideal romantic escape. 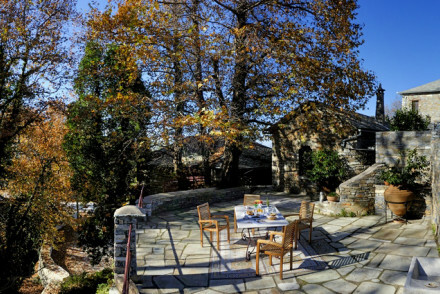 A pretty guesthouse located on the side of Greece's famous Pelion mountain. Rooms, suites and private villas are equipped with fireplaces and the best have in-room baths. The sea-view pool is magnificent, as is the award-winning cuisine. Ideal for those looking to get back to nature. Families - Villas 'maisonettes' available for up to five people - equipped with sitting room, kitchen facilities and bathroom jacuzzi!